Illinois law requires that a will meet certain requirements of validity to be submitted for probate. A person must be at least 18 years of age to make a will. Additionally, she must be "of sound mind," which means she is mentally competent to understand the nature of the property in her estate and who she names as beneficiaries. To guarantee the testator, person making the will, meets these requirements, Illinois law requires the will to be in writing and the testator must sign it in the presence of two witnesses. The witnesses affirm identity, age and competence of the testator by also signing the will. A will must be filed no more than 30 days after the decedent's death. The executor is the person selected to manage the decedent's property through probate and is often a surviving spouse if the decedent was married. The named executor is responsible for filing the will with the clerk of the Illinois circuit court in the decedent's county of residence. If the judge determines the will is valid and the executor is suitable, he will issue Letters of Office allowing the executor to collect the decedent's property and distribute it to the beneficiaries as spelled out in the will. A surviving spouse is entitled to financial support from the decedent's estate. The minimum award set forth by Illinois statute is $20,000 for the spouse and an additional $10,000 for the support of each of the spouses' children, which includes minor children and adult children residing with and dependent on the surviving spouse. The law also permits a spouse to file a petition with the court requesting an increase in support within nine months of the decedent's death. The court may award an additional "spouse's award" based on financial need and standard of living to which the surviving spouse and children were accustomed when the decedent was alive. A testator cannot disinherit a spouse. If a surviving spouse is left out of a will or is dissatisfied with the bequest in the will, she may renounce the will and seek her "spousal election." To do so, a spouse must file a written renunciation no more than seven months after the will was filed. The probate court is then required to award one-third of the decedent's estate assets to the spouse if the decedent is survived by any children, or one-half of the estate if there are no children. 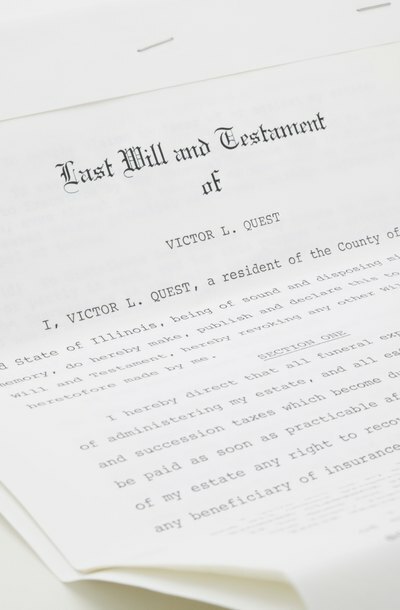 If no will is submitted for probate, or if a court finds the will invalid, a decedent's assets are divided according to Illinois intestate succession laws. A surviving spouse is the first entitled beneficiary through intestacy. If there are no surviving children, the surviving spouse is entitled to the entire estate of the decedent. If the decedent is survived by a spouse and at least one child, the spouse will receive one-half of the estate and the children each inherit equal shares of the remaining one-half of the estate. The purpose of any probate code, including that of Illinois, is to ensure a decedent’s property is properly distributed, any outstanding debts are paid and any children are looked after. The statute of limitations plays an important role in ensuring a decedent’s estate is promptly addressed. If you are currently a part of a probate hearing, consider hiring a licensed Illinois attorney.